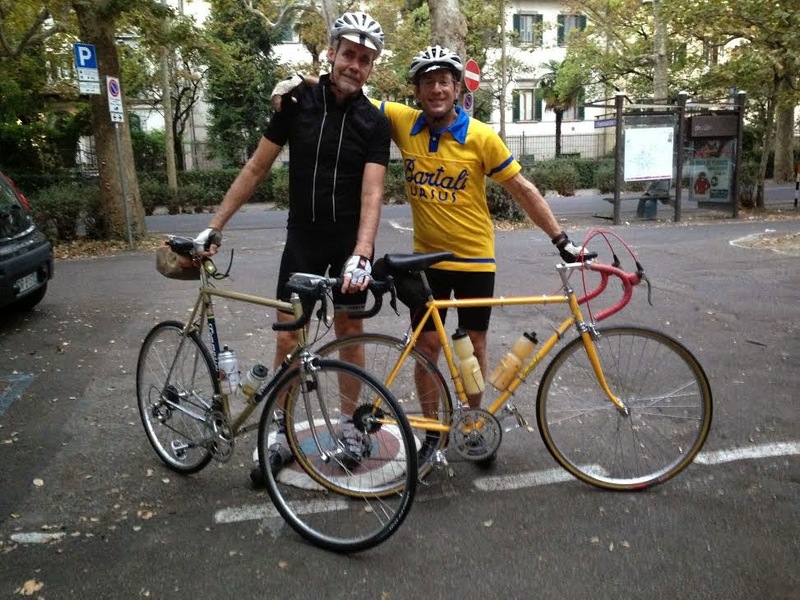 My thanks to Michael for sharing his story of following in the tire tracks of Gino Bartali; Michael is to the right in photo below (with Mark). Back in October of 1943, champion Italian cyclist Gino Bartali was recruited by a close family friend and Cardinal of Florence, Elia Della Costa, to ferry secret documents between Florence and Assisi in order to save Jews and other fleeing refugees from being deported to the Nazi death camps. 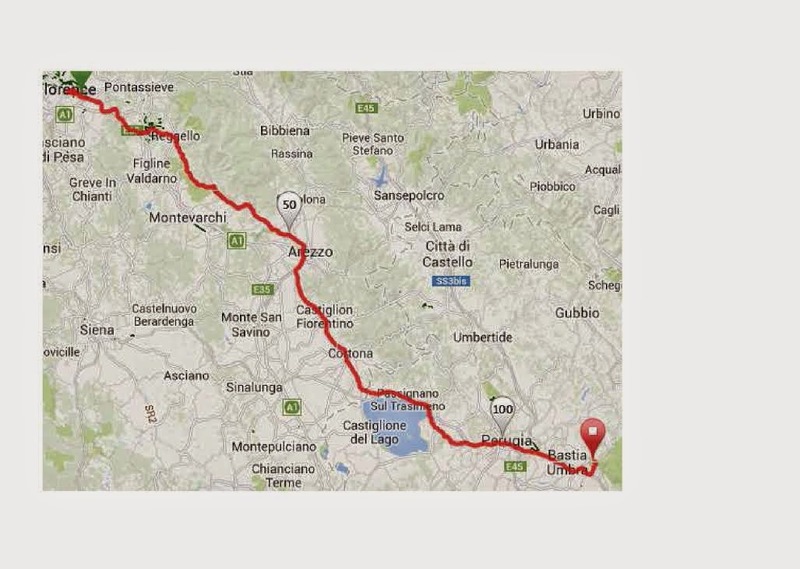 In honor of Gino’s heroic deeds of over 70 years ago, my friend Mark and I had decided to re-trace his route, by bike, from Florence to Assisi and back. Along the way, we tried to pass the many points of interest that related to Gino and his life during the war years. The following is a re-cap of our experience. My wife, youngest daughter and I arrived in Pisa airport a couple of days before The Ride and headed to Campiglia Marittima, where my old Brooklyn friend, Mark lives. Mark married Donatella, an Italian doctor, about 25 years ago and has carved out a beautiful life for himself with his wife and teenage daughter, Daria. Mark would be my only ride companion for the Bartali route and we had planned this together quite a while back, since we were both admirers of Gino and his war exploits. The idea was for us to follow Gino’s route from his home in 1943, into the center of the old town of Florence, where he picked up his documents and then out to Assisi and back. Bartali did this in one day, but we decided to stay over in Assisi and return the following day, since we are mere mortals and not campionissimi. It would still mean two difficult, back-to-back rides of over 110 miles each way, over hill and dale. Another dear, old Brooklyn friend, Johnny P, happened to be in Italy during my stay and was intrigued enough about our ride, and the places and people of interest that we had lined up, to want to join us. He would follow behind us in my rental car and provide on-the-road support for the entire ride. It’s a good thing he decided to join Mark and me because our trip would have turned out to be impossible without his help and resourcefulness. The bike I was to use for the ride was a fully-restored, early-mid 1960’s Gino Bartali that I bought in Italy over the winter from a British dentist. (Yeah, I know Bartali was riding for the Legnano team in 1943, but the Bartali was what I had in Italy, so that’s what I’m riding. Got a problem with that?). Mark was nice enough to pick up the Bartali from the seller and store it for me until my arrival. This gave me only 1½ days to sort out the position and make any repairs/adjustments needed. We discovered that the seatpost was too short for me and had to hustle over to Cicli Sumin, where Luciano managed to dig up the right seatpost diameter (26.0mm). The new post, although longer than the original, was still a little short for comfort, but we made it work. I replaced the existing bars, stem, pedals, saddle, brake levers and tires with parts I brought from NYC and the bike was ready for action. All I could manage was a brief test-ride as all of the roads in Campiglia Marittima went either sharply up, or sharply down. At least that short trip made me sure of the brakes and shifting. Early on Friday morning we all piled into the rental car, a Fiat Cinquecento 4-door, (me, my wife, daughter, Mark and John) and headed for Florence.After spending the day visiting points of interest related to Gino Bartali, like his museum, the piazza that bears his name and his family grave site (see installment #1 of this story) we all met back up for dinner. It was a quick meal and early bedtime for me because tomorrow was the start of the first long ride. Mark went to his friend, Gofreddo, to spend the evening and would meet us before sunrise back at our hotel for the send-off. Early Saturday morning, Mark walked over from Gofreddo’s house to the Hotel David and we rolled out of the driveway around 7:30am. John had another coffee and would drive to meet us at the first rendezvous point later that morning. Our first destination was the official ride start on Via Del Bandino, Gino’s home during the war. There’s no longer a #23 address there, but we found the oldest looking building on the block and took a quick photo anyway. Across from the street’s entrance is Piazza Cardinal Elia Della Costa, the cardinal who recruited Gino during WW2. Gino Bartali’s son, Luigi, still makes his home on that Piazza. Practically around the corner from Gino’s house was a 2-year old, modern (and ugly) piazza that was recently named after Gino Bartali. Mark and I rode along the Arno River and over the Ponte Vecchio's wet flagstones, with the top of Brunelleschi’s amazing dome visible in the distance. My Garmin immediately got confused in the small, medieval, alleys and we never made it to the Eugenian College chapel, where Bartali met with don Giacomo Menghello, Cardinal Della Costa’s secretary. That’s where the priest would have the dangerous task of passing refugee photos to Bartali for concealment in his seat tube during the trip to Assisi. We also had to forego a stop at Piazza dei Ciompi, where Gino’s cousin, Armando Sizzi had a bike shop and concealed a gypsy boy in his cellar during the war. Armando helped Gino to take care of the Jewish family that Gino had hidden in an apartment nearby. Since the Garmin was useless in the narrow alleys of the old city, we felt our own way back over the Arno and down past piazza Gino Bartali for the second time, gradually pedaling uphill towards San Donato. Garmin once again got confused when we reached the peak of the first test – the San Donato climb, and we ended up down a very steep dead end street. Mark, being an experienced bike guide, took matters into his own hands and asked directions (he is an exception to the rule that men don’t ask directions! ), and then led us through a series of small towns, down a steep descent through Rignano, and over a narrow, bumpy, one lane bridge over the Arno River. From there it was a long, uphill, switch-backed climb among fragrant foliage to one of the high points, altitude-wise, of our ride, Reggello. Bartali used to ride through Reggello because the man who made his racing shoes, Gennaro Cellai, had critical information about the current fascist roadblocks and checkpoints. Gino would try to avoid as many checkpoints as possible, but even when he encountered one he was recognized and treated as a celebrity. To avoid the discovery of his secret payload, Gino would always request of the guards that no one touch his bike, as it was adjusted to generate maximum speed. In Reggello, Mark spotted a public fountain near the main piazza and we re-filled our bottles for the first time. Where was John? There was no answer on his phone and his emails/texts were not helping us find each other. Eventually, John drove to meet us at the originally-agreed meeting spot and we encountered him when we gave up on meeting him in town. A quick, enthusiastic reunion ensued. Almost immediately, Mark and I were off again, heading south, along Via Sette Ponti towards Arezzo, with John following in the Fiat. It was about 11am on a slightly rolling road when Marks legs started to fail him. Mark is an extraordinary cycling guide, and a ride like this should have been child’s play to him, if he had his normally high level of fitness. Unfortunately, the phlebitis he was recovering from, the powerful blood thinners, along with the forced rest of a month and a half, were taking their toll on his body. He reluctantly climbed into the car, not wanting to slow my pace, or hurt my chances to finish the ride before nightfall. He would pay for his 4-hour effort, over two hard climbs, with painful leg cramps for the rest of the day. Now solo, I picked up the pace, worried about getting to Assisi before dark. Just north of Arezzo I noticed three riders sitting on my back wheel. 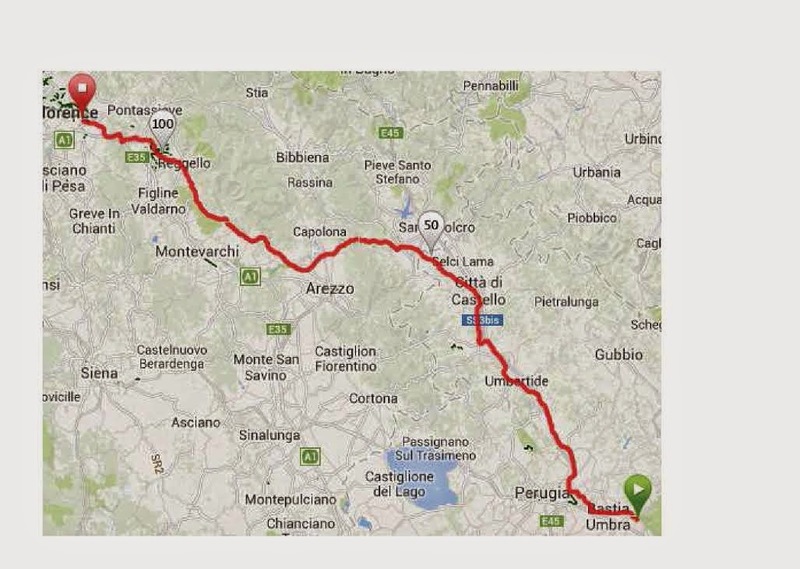 Armando, Lucca and Mauro were also on their way to Arezzo, to toast Lucca’s new bike acquisition. It was his new carbon Specialized's maiden voyage and Armando cordially invited me to join their drinking party. They were following an old Italian saying that I once heard, something along the lines of: “A good purchase should be wet with wine”. It was nice having company for the 10k we were together, but we parted ways once we got closer to Arezzo. I was heading toward Terontola, the train station, and a rendezvous with Ivo Faltoni. Ivo is the organizer of the annual Ciclopelegrinaggio ride and passionate Bartali devotee. Right after John and Mark roared away in the car to Terontola, I started hearing the clanking of my left crankarm on the chainstay. I had noticed a chip on the chainstay paint when I first saw the bike but had no idea that the previous owner had experienced the same issue I was now having on the road to Terontola. The bottom bracket’s (BB) fixed cup had come loose and was unwinding itself, pulling the BB’s spindle towards the right, causing the left crankarm to whack the chainstay with every pedal revolution. Crap! I stopped to hand-tighten it, but it came loose again after less than 1km. I did this 4 more times and then tried forcing it tight with the stub of a mini tool Allen key, with nary a rock in sight to add extra force. I thought my adventure was over. It was Saturday afternoon around 12:30 pm and there wasn’t a bike shop open in all of Italy. Even if I found an open bike shop, it would involve removing the drive-side, cottered crankarm and using a special BB tool as this fixed cup had slots around the edge instead of two large flats for a wrench. Most modern shops would not know what to do, or have the right tools for the job. A quick call to Mark's cell phone went unanswered, but they doubled back for me when they saw the missed call. As they pulled up in the car, I sadly explained that the fixed cup was loose and John simply said: “I’ll fix it”. Mark and I raised our collective eyebrows with skepticism and faint hope. We had no tools other than a small adjustable crescent wrench and my mini tool. John immediately goes to the trunk of the rented Fiat and pulls out the meager remnants of the emergency road-side kit. The only items left in the bag were a scissor-style car jack and the stub of a reversible screwdriver. That's it. I leaned the bike over as John put the flat-end of the screwdriver stub onto the BB cup slot and pounded away on the top of the screwdriver with the heavy jack. The fixed cup looked tighter than before and John joked that the next person to rent this car would have no idea what use the jack was put to by its previous driver. Problem solved, I motored along to Terontola, and our meeting with Ivo Faltoni. Rumors had it that, as a child, he was present when Bartali used to roll into the train station's cafe to distract the fascist guards. In all the fuss, the refugees could sneak onto the train to Genoa and be smuggled out of Italy. Ivo also claims that he grew up to be a mechanic for Bartali. We could not independently confirm either claim during our trip. The boys were already parking at the Terontola train station when I arrived and we hunted for the Bartali plaque, which Mark soon found on the station platform. Ivo arrived a few minutes later, and as it was getting late, I took a quick photo with Ivo and headed out of Terontola to our next meeting place in Maggiore. Mark and John spent more time with Ivo as he regaled them with his energetic stories and much gesticulating. Garmin’s directions out of Terontola got very confusing and it ended up taking me close to an hour to find the right road out of this small town. It had me heading 6k out of the way toward the highway entrance, which I was tempted to take - but for the complete lack of a shoulder, fast-moving cars and a narrow, single lane. Once back on course, I suffered through one more Garmin detour which took me down a steep road toward Lago Trasimeno, which turned out to be another highway entrance. I grunted back up the climb out of the saddle, to the secondary road, which I stuck to and ignored Garmin for the rest of the ride. Boy, was that incessant beeping irritating! The boys now had the task of keeping me in their sights as we navigated straight through the heart of Perugia. The center of a big town like Perugia sure had some busy roads! Mark, knowing the area well, had suggested that we head along a more rolling, southern route to skirt around the worst of it, but it was getting late and I opted for the most direct route to Assisi. I figured that if I got close enough to Assisi at dusk, they could follow me with their headlights on up the final climb to town. With one short break for a navigation meeting, we were soon on the long straight bumpy road to Assisi, as the late-day sun turned the religious city, rising in front of us, a brilliant sunset orange. The Assisi Memory Museum was already closed when we arrived, so we did not get to see Luigi Brizzi's printing press (where all of the false documents were printed during the war) or the exhibit about the heroic Assisi Underground of World War II. We made it to the Hotel Hermitage and checked in for a quick shower and a dinner rendezvous with Mark’s sister, Kathy. She lives in Perugia and drove up to see her beloved brother and his two wise cracking friends from Brooklyn. Dinner was a lot of laughs. I had a small appetite in spite of the number of calories burned, although I did consume a recovery drink before we left for the pizzeria. Maybe that killed the appetite? I can’t imagine what a daily chore it would be for a Grand Tour pro rider to consume the calories he would need to continue onto the next stage. You kind of have to force yourself to eat. Unfortunately, it was too late to pick up a St Francis relic for my friend back home, Frank, and I was too tired to climb the endless stairs of this beautiful city to visit the Piazza del Comune, and Cafe Minerva, where Father Nicacci, head of local underground network, and Luigi Brizzi used to play checkers. There was no air conditioning in the hot room and opening the window, like the sarcastic desk clerk suggested, brought in all of the flying insects of Assisi to buzz around the lights for the rest of my stay. Why are there no window screens in Italy? I slept heavily and woke to my alarm at 6am for a pre-ride breakfast of hot oatmeal and fruit. The car was loaded and we were ready for the trip’s next leg at around 7:30, when it was just light enough to ride. John and Mark played the role of soigniers extraordinaire, by filling my borraccias and tires before I began the return trip to Florence. I descended out of Assisi and down the gently sloping road to the first turn to the north near Santa Maria dei Angeli. The climb up to St Egidio was gentle enough to warm up my legs without an early strain. Once I passed through town I was treated to mainly flat roads for the first few hours. The seatpost of the Bartali had slipped from the previous day and, after raising it, it slipped yet again. Once again, John came to the rescue with an instant solution. After the third seat post stop in Umbertide, John pulled the post and then reached down to the ground with a wet finger. The dirt he picked up was introduced into the seat tube to provide additional friction for the post. It worked like a charm! The seatpost stayed put for the rest of the day. As I re-mounted my bike I was overtaken by a couple of riders and had the pleasure of their company for another few kilometers, until I turned off towards Nuvole, population: 45. Bartali moved his family there to live with his friend, Nello Capaccioni, after a harrowing interrogation by the fascists at Villa Triste in Florence. The fascists suspected that Bartali was up to something with his trips to Assisi and beyond, but they couldn’t prove anything and released him after a few days of hell in one of their cold, damp cells. The flat roads I enjoyed earlier in the day were forgotten, as the climbing over the mountain range began with a steep road up to Anghiari. Other cyclists on the road up included a rider with a prosthetic leg (he took the mountain prize, as first over the top), a cyclist in period garb on a vintage road bike (a man of the same mind as me, I would imagine) and a woman in long skirt, on a bike with a basket up front. I was out of Anghiari and onto the main, wooded climb before descending back to the Via Sette Ponti for the northward trip back to Reggello. It’s interesting how the scenery looks completely different when you travel the same, familiar road in the opposite direction. What’s in front was what’s behind before and you take in the other part of the 180 degree panorama that is the view from a bicycle seat. Up and over Reggello, I passed the sharp curve on the descent from San Donato, near Osteria Nuova, where there is a memorial plaque to Gino's brother, Giulio. Giulio Bartali died tragically in a bike crash while racing there in his youth. Gino often stopped here while training to offer a silent prayer for his beloved brother. I had stopped to refill my water bottles, as the temperature climbed above 80 degrees Fahrenheit that day. It was time for the surprise I had planned for Mark. I asked John to man the camera while I pulled a wrench from my seat bag to loosen my seat binder bolt. For the entire ride, I had been carrying within my seat tube a copy of a false identity document that was forged by Luigi Brizzi for the Assisi Underground. It was the type of document that Gino would have carried back to Florence inside his own seat tube. Superimposed on the photograph was Mark’s head shot, proclaiming him a resident of Lecce, with the name of “Emidio Vitelli”. These false documents had to claim to originate south of the front line, within the allied territory, so that the fascists could not verify their accuracy. Now Mark understood why I was calling him “Signore Vitelli” all day long! The final 20 miles of the return trip included a series of long, steep, leg-burning climbs until I got close to the center of Florence. The flat roads to Viale Europa and a short jaunt along the Arno brought me back to our starting point, Hotel David. John went straight up to his room for a well-deserved nap. All that driving must have been very draining for him. Mark headed back to his friend’s house for the night. I imagine he also turned in early so that he could catch a morning train back to his home, and his family responsibilities, in Campiglia Marittima. A great account and historical notes. Thanks.